“This is a project that we had been dreaming about for years, if not decades,” said Pedro Silva Reis, Chairman of Real Companhia Velha (RCV), as he welcomed us to the company’s 17.56 Museu & Enoteca. “This space near the river was for many years one of our company’s warehouses” he told us. 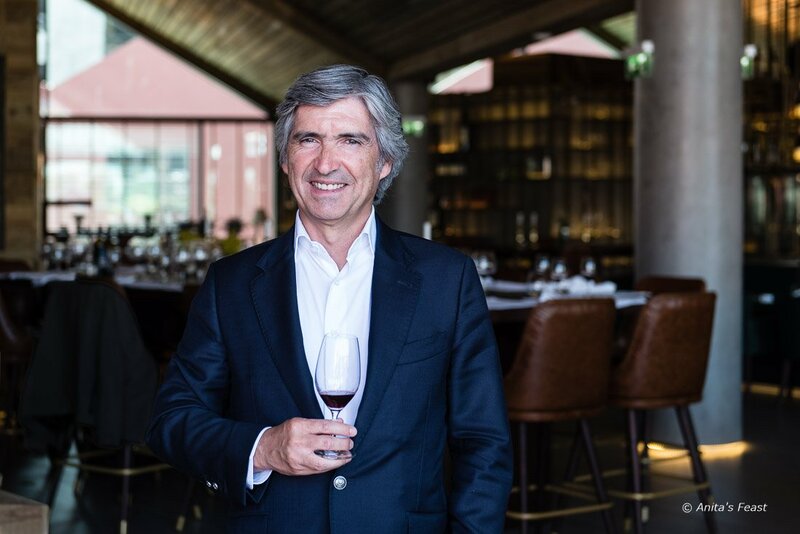 “We return now to offer a new Porto destination—a visitor center where wine, gastronomy and history complement each other.” With the opening of the sleek museum and wine bar, the venerable wine company aspires to take its place on the international circuit of wine connoisseurs. As our host toured us through the museum, he told the story of Real Companhia Velha. 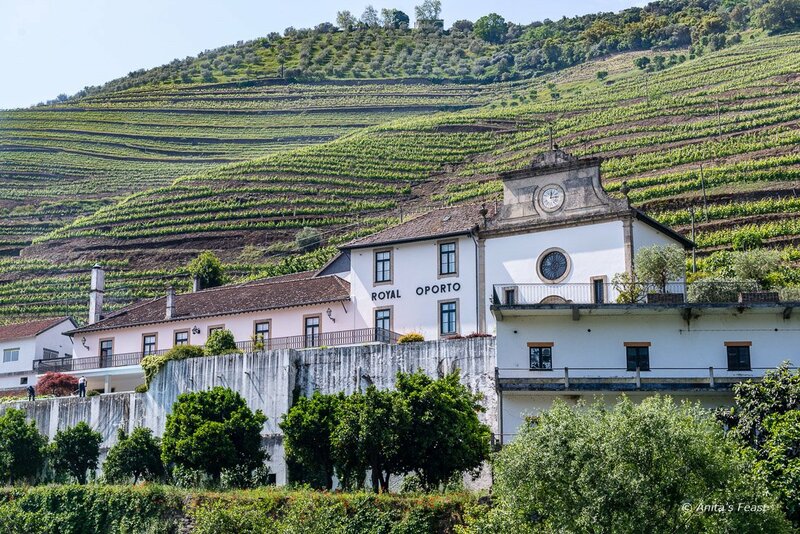 The company’s origins are inseparable from the prestigious beginnings of the Douro wine region, the oldest demarcated and regulated region in the world. Both were signed into existence by Royal License of King Don José I in September 1756, under the auspices of the Marquis of Pombal. That license, along with other artifacts from the company’s history, is on display in the museum, augmented by digital displays. 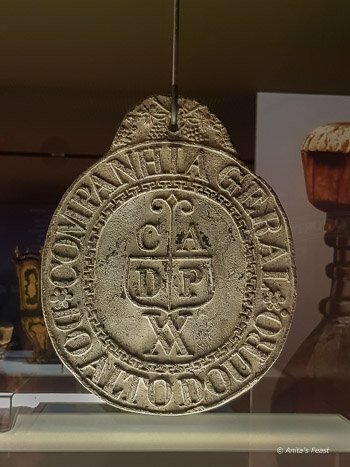 The 17.56 Museum of the 1st Demarcation promotes and shares the history and the culture of port wine, in which Real Companhia Velha played a major role between 1756 and 1834. The exhibits are on the ground floor, adjacent to the wine shop. When the center opens later this month, entrance to the museum will include a tasting of two table wines and a port wine. 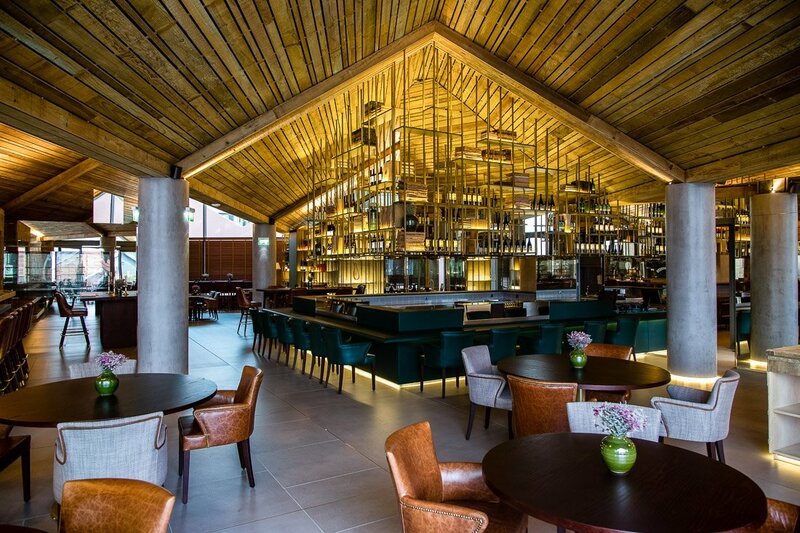 The Enoteca is the visitor center’s gastronomic hub on the first floor, and it is here that 17.56 takes flight with a new concept for the lodges that line the quay at Vila Nova de Gaia. Wine is king here, complemented by a range of delectable gastronomic offerings. An expansive list of more than 500 wines begins with the large portfolio of Real Companhia Velha. Affirming Porto as a world capital of wine—and not only port wine—the wine bar also pays tribute to the top wines of Portugal, and to iconic Old-World wine producers from across Europe. 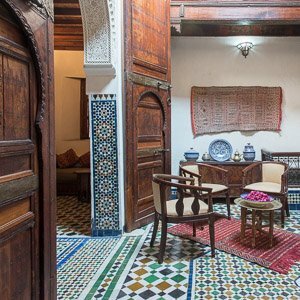 Visitors can settle into leather chairs around low tables in the lounge area or enjoy the view from the panoramic terrace. Guests can book a private tasting room, and savor port wine in the cigar club. The ambiance is ideal for enjoying a glass of wine on its own, or with an appropriate pairing. A full dinner menu offers an in-depth experience. The Enoteca kitchen, headed by Chef Nuno Travassos, presents traditional Portuguese cuisine and features seafood. Shiko, a Japanese-inspired raw bar, is under the direction of Ruy Leão, owner of the popular Shiko – Tasca Japonesa in downtown Porto. The Retoria provides gourmet sandwiches and steakhouse specialties. Cheeses from Fromagerie Portuguesa can be enjoyed on site or purchased to take away. Our advance taste of wines and food at 17.56 Enoteca left us salivating for more. When we visited, wines from the RCV estates provided a beautiful and satisfying introduction to the concept and ambitions of the new gastronomic space. Every wine we tasted was an introduction to Portuguese grapes, Douro cultivation methods, and superb wine-making. The food paired beautifully. Sunomono and white port: divine! 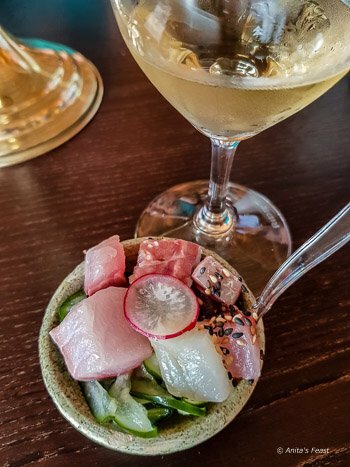 Appetizers—mini fritters of spiced codfish, and from the raw bar, kimchi, and sunomono with sea bass and tuna—were served with our choice of Real Companhia Velha Espumante 2014, Royal Oporto Extra Dry Porto branco, or Quinta de Cidrô Alvarinho branco 2016. 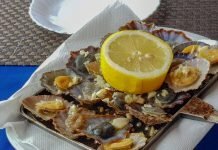 With my glass of white port, every bite was a match made in wine heaven! Our first course of shellfish came with a crisp white wine from the plateau of Alijó: Quinta do Síbio Arinto branco 2016. It was a bright beginning with echoes of citrus and a slight minerality. A tomato-based fish soup followed, paired with Quinta do Síbio Field Blend branco 2015, a full-bodied and creamy field blend from old vines, fruity and spicy. 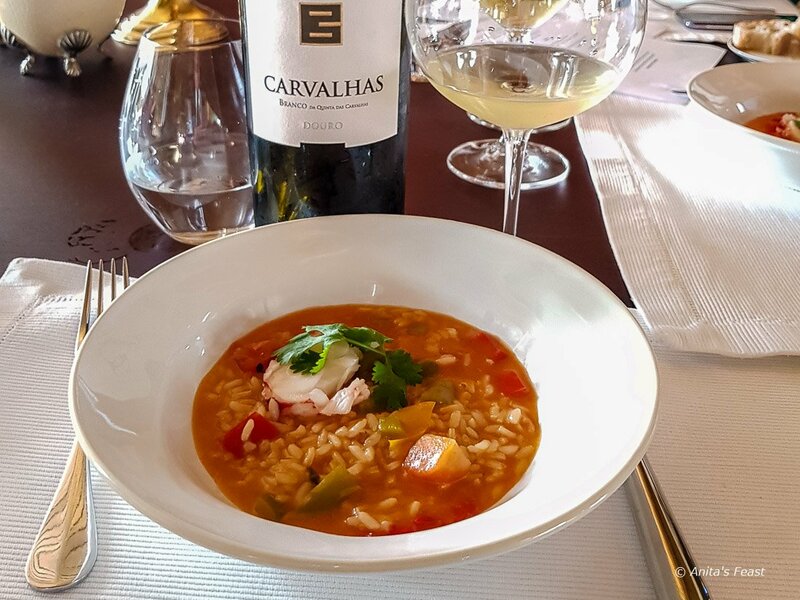 Carvalhas branco 2016, a fine wood-aged white, was perfectly matched with a dish of lobster rice. Our luncheon at 17.56 was as convivial as it was tasty. 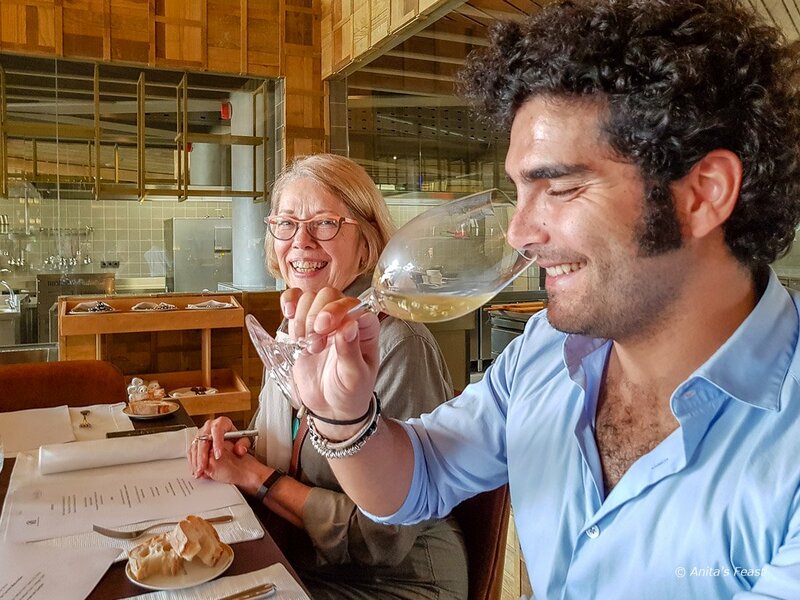 The younger Pedro Silva Reis, RCV Trade-Marketing Manager, kept us entertained and informed with running commentary on every wine. Pedro Silva Reis introduces us to a great white from Royal Companhia Velha. 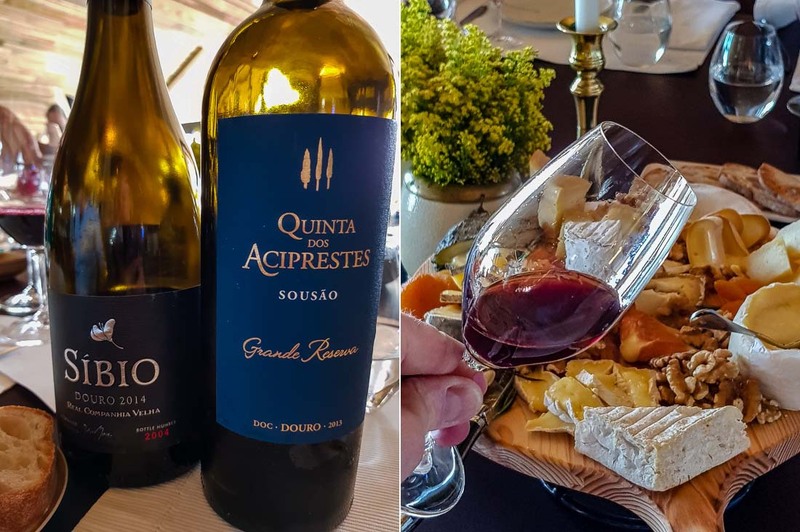 Two red wines with distinctive features accompanied platters of aged meats: the vibrantly red, aromatic Quinta dos Aciprestes Grande Reserva red 2013, a Sousão monovarietal, and Síbio Douro Tinto 2014 a limited-edition Douro red, rich and tannic, with ripe black fruits and beautiful acidity. As if all that were not enough, we enjoyed two fine ports with an array of international cheeses: Real Companhia Velha Porto Tawny 20 Anos and Quinta das Carvalhas Porto Vintage 1997. We sampled RCV port wines when we toured the Quinta das Carvalhas vineyards on our memorable first visit to the Douro. It was a pleasure to end our feast at 17.56 with a port wine toast to the company’s founding. 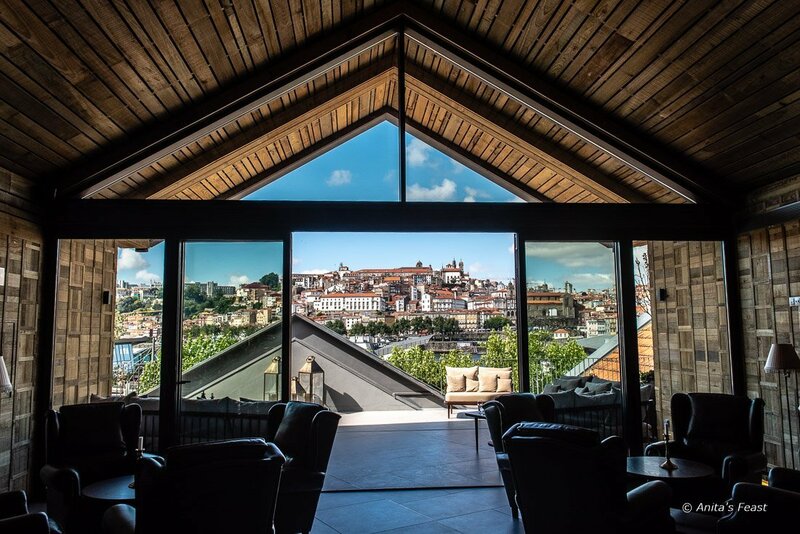 Real Companhia Velha—Portuguese-owned since the beginning and since 1960, operating under the direction of the Silva Reis family—has been going strong since the demarcation of the Douro wine region in 1756. The company’s new visitor center is a splendid addition to its other offerings for visitors to Porto and the Douro. For an in-depth port wine experience, visit the company’s cellars for aging port wines and tasting room a short distance away in Vila Nova de Gaia, or visit Quinta do Carvalhos, an RC wine estate across the Douro River from Pinhão in the Cimo Corgo. Opening of the 17.56 Museu & Enoteca in Vila Nova de Gaia is set for Thursday, 30 August. Entrances are at Alameda da Serpa Pinto Street, 44B (main entrance) or via Avenida Ramos Pinto. The museum visit is 15 euros per person, with wine tasting. Museum hours: 10:30 a.m. to 7:00 p.m.
Enoteca hours: 11:00 a.m. to 11:00 p.m.
What a gorgeous place! We only got to spend a day in Porto and this makes me want to go back! That company has quite a history, and it sounds like those wines were magnificent. A museum and enoteca in one sounds like a great idea. What a lunch that must have been! It was a luncheon FEAST, Irene. We loved the setting as well, and will be back for sure. Porto has been calling my name for quite a while now. This combination of museum and enoteca sounds wonderful and has gone to the top of my list! The cheese plate alone is enough to make me very happy, combined with great wines, my husband and I would be in heaven in 17.56. 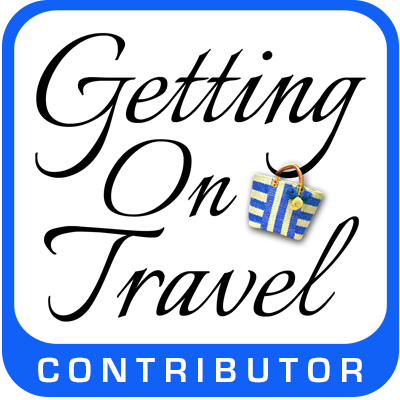 Hello James, Your wine tour sounds marvelous, and quite on point with latest developments here. So glad you enjoyed 1756 Museum & Enoteca as much as we have! 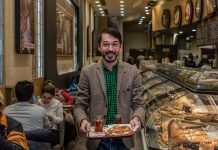 Autumn: Switzerland’s best time for food travel? 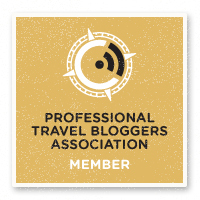 Modena, Italy—your next food adventure?